1. Equifax in the hot seat: Equifax (EFX) will be on Capitol Hill on Tuesday for the first of three consecutive days of hearings over its massive security breach. It promised to be a public flogging: The credit reporting firm revealed Monday that an additional 2.5 million Americans may have been affected by the hack, bringing the total number to 145.5 million. Equifax said last week that it's investigating three executives who sold shares worth nearly $2 million shortly after the massive data breach was discovered, but before it was revealed to the public. 2. Wells Fargo hearing: Wells Fargo (WFC) will also face lawmakers on Tuesday. CEO Tim Sloan plans to tell Congress that management failed to take decisive action to head off the scandal that has rocked the bank for the past year. Wells Fargo has identified 3.5 million potentially fake bank and credit card accounts that were created to help meet management targets. 3. Angry Birds flops: Rovio Entertainment, the Finnish maker of Angry Birds, made its official debut on the Nasdaq Helsinki. But the IPO has failed to take flight. Rovio shares dropped by nearly 4% to just under €11 ($12.90) on Tuesday. The company is now in danger of losing its $1 billion valuation. 4. 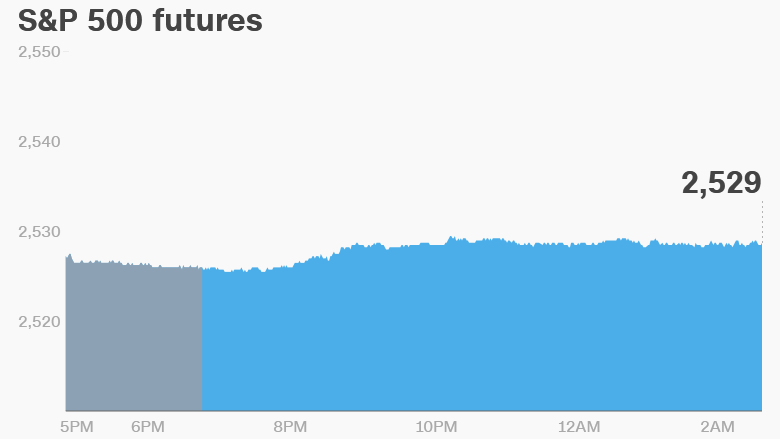 Global market overview: U.S. stock futures were pointing higher. European markets opened in positive territory, while most Asian markets ended the session higher. Markets in mainland China were closed. U.S. markets reached new record highs on Monday. The Dow Jones industrial average added 0.7%, while the S&P 500 gained 0.4% and the Nasdaq advanced 0.3%. 5. Companies and economics: Uber CEO Dara Khosrowshahi will meet Tuesday with London transportation officials in hopes of renewing his company's license. The city's transit authority said last month it would not renew Uber's license, saying the company was not "fit and proper" to operate in the city. Khosrowshahi faces more trouble at home: Uber is expected to vote Tuesday on a measure that could lessen the influence of former CEO Travis Kalanick and also set a deadline for the startup to go public. Shares in Tesla (TSLA) will be in focus after the company announced it fell far short of its plan to build 1,500 of its first mass market car, the Model 3, in the third quarter. It said it only built 260 vehicles, or 83% less than promised. The announcement was another sign of the challenges the upstart electric car maker may face as it tries to build a more affordable electric car -- a basic version of which priced at about $35,000. The U.S. Commerce Department will release its September Auto Sales report at 2:00 p.m. ET. The National Retail Federation is expected to release its U.S. holiday sales forecast on Tuesday. Australia's central bank left interest rates unchanged at its meeting on Tuesday. The Australian dollar slipped as much as 0.5% against the U.S. dollar after the decision was announced.